"Always tend the smallest amount of land possible, but tend it exceptionally well." - The first principle of success as given by a leading Parisian grower in the 1870's. I have been reading Eliot Coleman's The Winter Harvest Handbook. Mr Coleman is an organic market gardener in Northern Maine, USA, producing very high quality produce year round. He is also a champion for new growers like ourselves. His book are manuals on small scale, organic vegetable growing techniques, tools, rotations and historical inspiration. Here is a summary of what he has to say about the "French garden system". Practiced by Parisian maraîchers (market gardeners), it reached it's height in the mid to late 1800's with around 1800 growers producing food on one to two acre blocks. Covering about one-sixteenth of all land within the city limits of Paris, the gardens fed Paris year round with a huge variety of produce, both in season and "out" of season vegetables and fruits. This system not only incorporated incredible intensive planting techniques, it was sustainable. The Parisian maraîchers were referred to as "goldsmiths of the soil". Both the heat for winter production of vegetables in hotbeds and the amendments to maintain the fertility of the soil were by-products of composting another by-product - the horse manure mixed with straw that came from the city stables. After delivering crates of produce to the market, wagons would collect the manure on their return to the garden. Paris was home to 2.5million people in 1891 and these small, intensive, "organic" market gardens provided all the produce, and produced enough to export to other neighboring countries. And not just any sort of produce...last week the latest Diggers magazine arrived with a wonderful article on seeds before genetic engineering and the re-printing of the French seed company Vilmorin's album of exquisite drawings. The diversity of varieties known and grown by the French in the late 1800's was extraordinary. As Clive Blazey writes, "Vilmorin listed over 1400 vegetable varieties in 1885...when compared to the 236 varieties offered by The Diggers Club today." I love learning these sorts of facts. I love knowing that we, as farmers, are not re-inventing the wheel. We are trying to learn practices that once thrived on a large scale. We are trying to grow produce for the local community while continuing to build soil fertility. And we are also trying to keep alive varieties of many vegetables which are not being offered to the consumer, varieties that make eating vegetables and fruits a real experience. As Blazey writes, "The rock melons offered in today's Australian supermarkets are a travesty of the delights that 'could cause drooling' to quote melon expert Amy Goldman. The latest melon from Seminis (Monsanto [the makers of Round-up and one of the leading corporations involved in genetically modified seeds] ) is actually called Hard Rock so completely and humourlessly has this multinational bred the latest hybrids." And that brings us to our 2013 melon varieties...Most are heirlooms and we hope they will all be that small slice of juicy, perfumed summer sun...We transplanted them last week and they are loving this heat. Depending on the season, they should ripen by the beginning of February and continue into the Autumn share. Honey Dew "Eden's Gem" Heirloom. Small, round, netted fruit the size of a softball. Spicy, sweet flesh. Honey Dew "Early Hanover" Heirloom. Sweet, sugary flesh that can be eaten right to the rind. Cantaloupe "Hearts of Gold" Heirloom. Highly aromatic, sweet, firm, juicy, salmon coloured flesh. 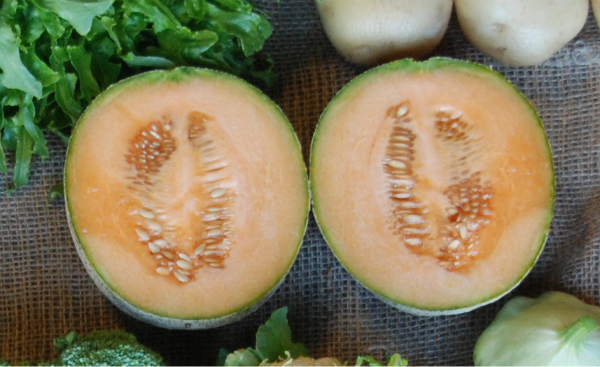 Cantaloupe "Schoon's Hardshell" Sweet, flavoursome, apricot coloured flesh. Cantaloupe "Hale's Best" Sweet orange flesh. Cantaloupe "Delice De Table" Heirloom. Very sweet orange flesh. Cantaloupe "French Charentais" Heirloom. Sweet, thick, deep-orange, flesh. Flesh has deep, aromatic, flowery aroma. Watermelon "Criss Cross" Heirloom. Attractive, pale green skin & jagged, dark green markings. Flesh is deep, rich red with excellent flavour & crispness. Watermelon "Crimson Sweet" Large, round, light green melon with dark green stripes and firm, deep red flesh with high sugar content. Watermelon "Sugar Baby" Round - oval melon with dark green rind, juicy, sweet, bright scarlet flesh & firm texture. Watermelon "Moon and Stars" Heirloom. Very sweet, rich, red flesh. The rind is patterned with yellow markings and the foliage can be speckled yellow as well. Watermelon "Klondike" Heirloom. Large, striped, oval melon with sweet, scarlet coloured flesh & thin, tough rind.